Buxtronix: Big capacitor + metal shavings = ? 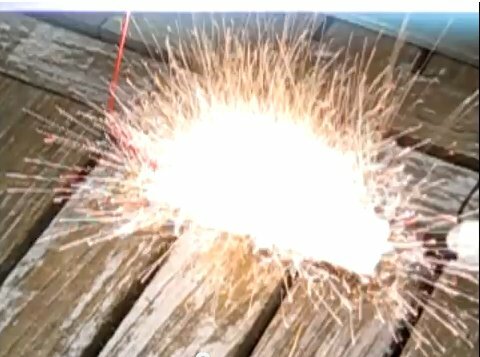 ... a very fast (100th of a second) shower of metal sparks. A while back I acquired a very beefy capacitor. It is 0.25uF, rated at 35,000v. That is a total energy storage of 150 Joules! A typical camera flash has but 10 Joules of energy. Charging it takes about 30 seconds with a Flyback supply, and I can only get to about 25kV (78 Joules), but I'm hoping to boost that with a neon sign transformer. I saved a whole load of aluminium shavings from my milling machine, then emptied 0.25uF @ 25kV across a sprinkling, giving some very dramatic discharges. I've got a whole pile more, so I will also have to try with other ways of holding the shavings, eg paper, water, glue, etc. Video below - the first half shows a normal 30fps capture that the CCD doesn't do justice for, but it also includes video shot at 240 frames/sec with much better wow factor.